Last weekend, Ian Bogost made a website, buns.life, that lets you make a graphic featuring words between hamburger buns. Why? Because Ian Bogost thinks there should be more words between buns. And because Ian Bogost likes to make weird things. Immediately upon finding out about buns.life, I had to try it. But what words to put between hamburger buns? 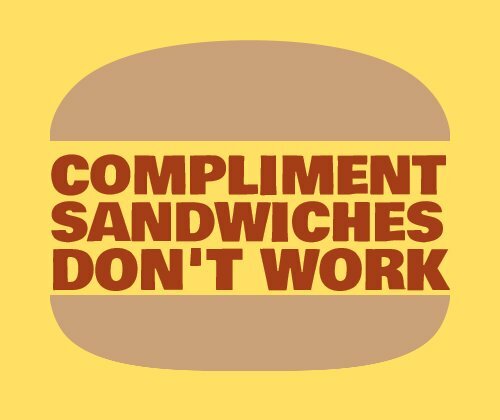 I settled on “Compliment sandwiches don’t work.” And, naturally, I tweeted out my creation. The tweet got a few likes, but also one note of pushback on the message in my new hamburger graphic. That’s when I realized that not everyone attended the 2015 POD Network conference keynote by Beverly Daniel Tatum. (This seems an obvious realization in hindsight.) It was during that keynote that the myth of the compliment sandwich was busted for me. 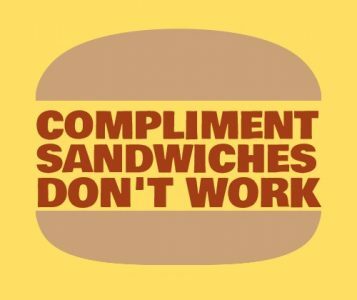 The compliment sandwich is a method of providing critical feedback in which the criticism is sandwiched between praise. That is, one provides a bit of praise, then the criticism, then some more praise. The idea is that by sandwiching the criticism with some good words, the feedback recipient will more willing to hear and act on the criticism without losing confidence. I’m not sure why we use a sandwich metaphor for this, since the good part of most sandwiches is what’s in the middle, not the buns, but it’s a commonly advocated feedback technique. The problem is, it doesn’t work. At least, not as well as other feedback techniques. That’s what I learned from Tatum’s keynote back in 2015. She was addressing the challenge of fostering persistence among under-represented minorities in colleges and universities. For instance, students of color are known to switch out of STEM (science, technology, engineering, and mathematics) majors at higher rates than white students (Graham et al, 2013). One small piece of this complex problem involves providing useful feedback to students, particularly feedback from a majority advisor to a minority student. I was surprised to hear Tatum say that the compliment sandwich doesn’t work, because I’ve been told many times to use the sandwich when providing feedback, but the research she shared in her keynote was persuasive. Steele and colleagues ran a study to see if there were better or worse ways to provide critical feedback to minority students. They asked college students to write a letter of recommendation for a teacher who inspired them, then provided critical feedback of their writing in one of three different ways. One group received just the criticism (“unbuffered criticism”), another group received the criticism prefaced by positive comments about the student’s writing (“criticism + positive buffer”), and a third group received what the researchers called “wise feedback,” that is, criticism accompanied by messages that communicated high standards for the work and assurances that the student was capable of meeting those standards. All students in the study, white and black, were led to believe that the source of the feedback was a white professor. The results were dramatic. When students were asked to rate their motivation for revising their letters of recommendation, white students were similarly motivated across all three groups, but black students were far more motivated to persist in the task when the criticism was buffered, either by praise or in the “wise feedback” mode. Students were also asked questions that measured their identification with writing skills, questions like “How open are you to career options that would require writing skills?” and “How would you rate your overall competence as a writer?” For these questions, there was little difference among white students in the three groups, but black students in the “wise feedback” group showed much greater identification with writing skills than black students in the other two groups. My hamburger graphic isn’t quite accurate. Compliment sandwiches do work, in that providing praise along with criticism is generally better than providing criticism alone. However, they aren’t the best option for providing feedback to students, especially students who may experience stereotype threat. I was grateful to learn about “wise feedback” from Beverly Tatum back in 2015, and I hope my hamburger graphic serves as a reminder that we can use the feedback we provide students to help them persist and succeed in our classes and programs, if we communicate high standards and a belief that our students can meet those standards. Cohen, G., Steele, C., & Ross, L. (1999). The mentor’s dilemma: Providing critical feedback across the racial divide. Personality and Social Psychology Bulletin, 25(1), 1302 – 1318. Graham, M., Frederick, J., Byars-Winston, A., Hunter, A., & Handelsman, J. (2013). Increasing persistence of college students in STEM. Science, 341(6153), 1455-1456.